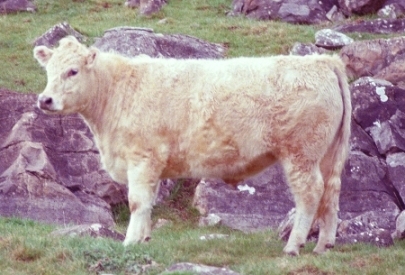 Galloway cattle cross well with most breeds. Being an ancient hill breed, the hybrid vigour and evenness of progeny seems to be greater than most. AP advocates natural conditions as far as possible, with minimum interference. 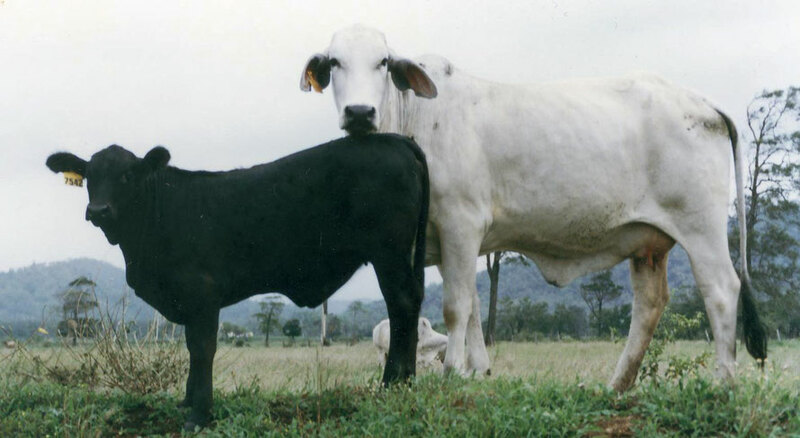 The most valued animals have `long, thick and deep bodies, with great foraging ability, good maternal characteristics, quite cattle with a soft skin and coat, all going to produce a high quality & yielding carcase. 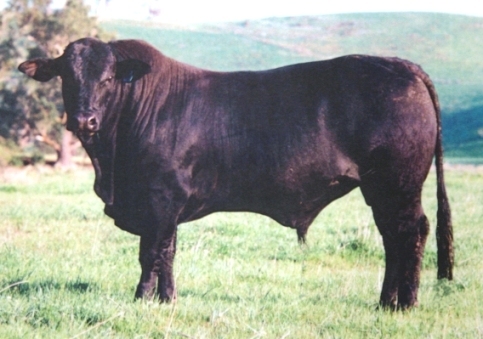 The great success of AP Galloway crosses over many decades has proven the advantages you can get to your triple bottom line by cross breeding in your beef enterprise. Galloway X Hereford: 10 mth old calves on heifers that calved at 22-24mths of age with only one calf pulled. Made great money in the Bairnsdale market. Shorthorn X Galloway (Blueroans) cows - 12 to 17years of age with Limo calves at foot. 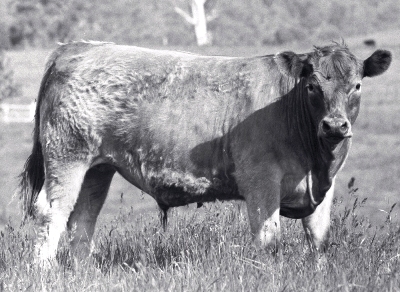 The 17yr old cow's last calf was champion vealer carcass Bairnsdale. Above: Galloway heifer (AP Rose) with her first calf by Shorthorn bull. Weaning weight: 350kgs. Champion Carcass with max points for eye muscle. 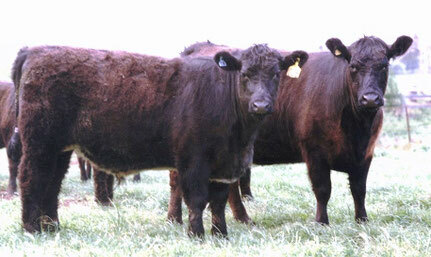 Right: Scottish Black heifer with first calf by Galloway bull (AP Wombat B4). Over 400kg at 11 months. AP Dun Galloway sired steer out of a ShorthornxGall cow. Brahman X Galloway 2 year old bull. 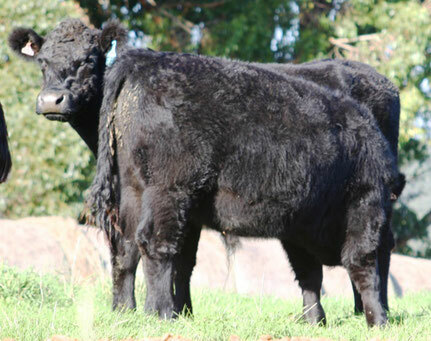 His steer mates won the Gippsland Grazing Trial weight gain: 1.8kg/day for 150 days. 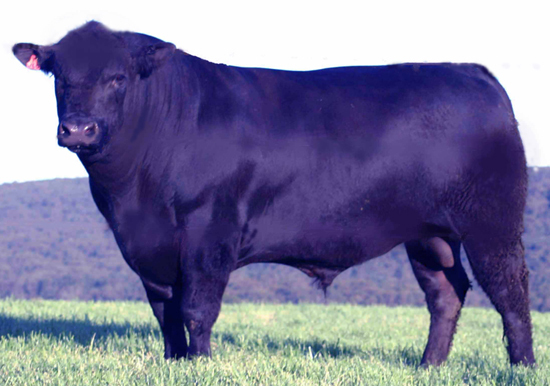 Scottish Black bull, 3 years old, pasture fed and worked as yearling - 1100kg.